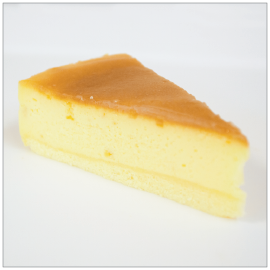 Introducing Japanese-style baked Yuzu Cheesecake. Blended with a lavish amount of yuzu marmalade into the cheese batter and topped off with a thin layer of yuzu glaze. The delightful tang of yuzu is flawlessly balanced with just the right amount of sweetness that will fulfill cravings for sweets. This creamy yet fluffy cheesecake with the refreshing flavor of yuzu is a perfect dessert after a meal. Cream Cheese (Milk, Cream, Salt, Locust Bean Gum), Marmalade (Sugar, Millet Jelly, Yuzu Peel, Reduced Sugar Syrup, Yuzu Juice, Gelling Agent (Pectin, Sugar, Locust Bean Gum), Citric Acid, Sodium Citrate, Beta-Carotene Color), Egg, Trehalose, Sugar, Nappage (Sugar, Millet Jelly, Pectin, Citric Acid, Trisodium Citrate, Gellan Gum), Margarine (Palm Oil, Milk, Salt, Butter Flavor, Cream Flavor), Wheat Flour, Corn Starch, Yuzu Citrus Puree (Yuzu Fruit, Sugar), Emulsified Oil (Vegetable Oil (Rapeseed, Soy), Millet Jelly, Cyclodextrin, Dextrin, Milk Protein, Glycerin Fatty Acid Ester, Sucrose Fatty Acid Ester, Ethanol, Xanthan Gum), Sweetened Egg Yolk (Egg, Sugar), Maltose, Millet Jelly, Milk Mix (Skim Milk, Rapeseed Oil, Whey Powder, Lactose, Milk Protein), Water.